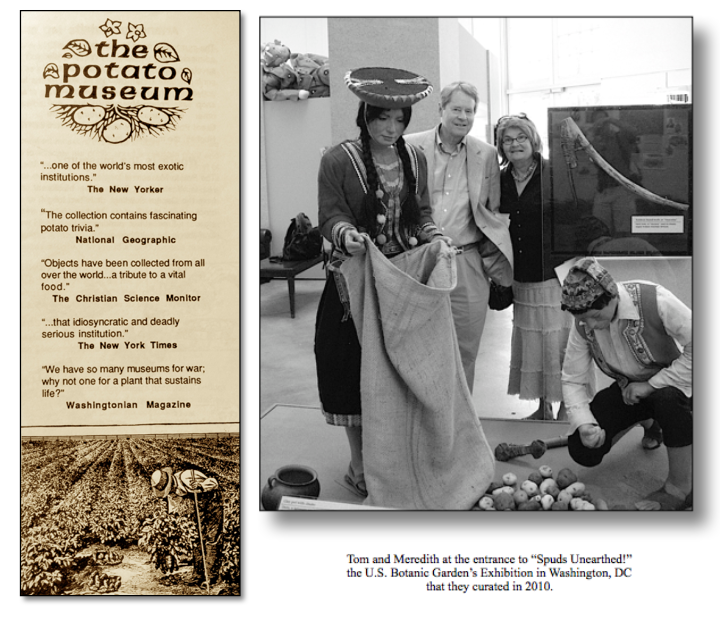 Tom Hughes and his wife, Meredith Sayles Hughes, are the couple behind the world’s first Potato Museum, the Food Museum Online, and the Food Heritage Center. The museums research, collect, preserve, exhibit and explain the history and social significance of the world's foods, and bring artifacts and programs to audiences of all ages. The Hugheses are pioneers in exhibiting food history, as curators of major exhibitions at the Smithsonian, the United States Botanic Garden in Washington, DC and Canada’s National Museum of Science and Industry. They also are innovators in “pop up” exhibits, including a series of three-foot square kiosk displays in supermarkets on 15 different food topics. Tom and Meredith are the authors of many books including Gastronomie! Food Museums and Heritage Sites of France. This was the first book to define and explain the concept of food historic sites. Author of several articles on food history, Meredith created the award-winning 10 book series, "Plants We Eat," published by Lerner Publishing, Minneapolis. She has been a workshop presenter at the International Association of Culinary Professionals Annual Conference. Tom, a teacher, did two nationwide educational tours, speaking to civic groups and as a guest on radio and tv talk shows, both national and local, including “Late Night with David Letterman, “NBC Nightly News” and “Charlie Rose.” Under the wing of a new venture he started, EATS Publishing, Tom Hughes has published several books, the newest being Food Heritage Matters: How We Ate and Will Eat, and Eats History: Cooking with Fire to Printing up Pizza. Also in 2017, Meredith and Tom co-wrote Potato Heads: Their Illustrated History. Meredith and Tom have collaborated on a wide range of public programs and lectures, both here and abroad, as well as teacher workshops, school presentations, panels and served as consultants on a wide-range of documentary film and publishing projects. Next to accomplish: establish a permanent base for their Food Heritage Center and its proposed global network of food-themed museums and historic sites while continuing to advocate for a National Museum of Food in Washington, DC. I’ve stood in potato fields on five continents, interviewed many of the world’s key potato authorities, eat- en the planet’s potato specialties, grown some four dozen varieties in various home gardens, with my wife written two potato books with more in the works, and numerous articles. I’ve given talks at The International Potato Center in Peru, at an international gathering of potato scientists in China, and at Cor- nell, one of the planet’s preeminent potato research universities, among many other places. My collection of potato memorabilia, said to be the world’s most comprehensive, has been featured in major museum exhibitions. 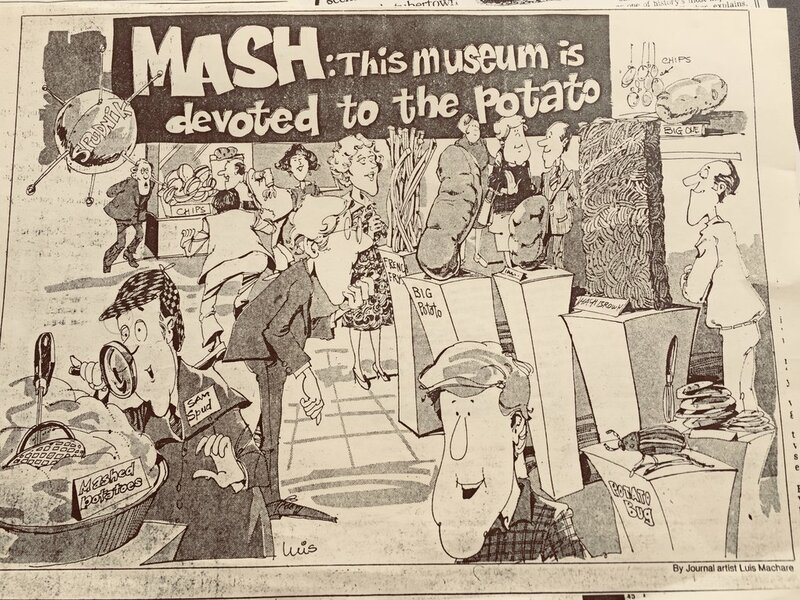 Everyone always asks how and why I got involved in starting a museum about the potato and all that followed. What was so interesting about potatoes and the history of food in general that launched and sustained this enterprise? Like most people, I’d eaten potatoes all my life but never gave them much of a thought. In my childhood home, potatoes were on the plate breakfast, lunch and dinner. Though my dad always kept a vegetable garden, he didn’t grow potatoes. My life’s passion, some say obsession, began when I kicked a soccer ball into my friend Jack Hill’s sub- urban Brussels, Belgium potato patch. There I encountered for the first time the plant whose under- ground tubers I’d been consuming since birth. I can still hear Hill’s thunderous voice from the porch yelling: “Tom Hughes, mind you take care of my potatoes, now.” Potatoes? So that’s what the plant looks like, I remember thinking. I took a good look at it. Then I resumed playing with Jack’s three sons who were students at The International School of Brussels where I taught fifth grade. My wife, a journalist, and I had moved to Brussels the year before and were living south of the city in a rural village on the edge of the Waterloo battlefield. Living in Belgium, we already were fans of the twice fried potatoes that were available everywhere from tiny roadside “frites” stands. Soon thereafter, one sentence in an International Herald Tribune newspaper interview with BBC presenter and author Kenneth Hudson about the world’s museums jumped out at me: “Of the (then) 25,000 museums in the world, none were about the potato.” Hudson, author of The Directory of World Museums (1974) wrote “Here, too, (in Ireland) one might reasonably expect to find a really imaginative and com- prehensive Museum of the Potato, but there is none.” The potato?! A museum about the potato?! What could be so fascinating about the potato that it deserved to be recognized in a museum? I read the article to my students and challenged us all to explore potatoes from as many different perspec- tives and disciplines as possible. We intended to discover why the words potato and museum might go together. Back in grad school at City College of New York (CCNY) I had learned about “best practices pedagogy.” First take a common theme of interest. That was easy. As ex-pats in Belgium we all ate French fried potatoes or “frites” with mayonnaise. In fact, a frites stand stood across the street from the entrance to our campus. Next, establish the project’s organizing question: “What is so noteworthy about the potato that it might merit its own museum and what would be exhibited?” Then, divide the group into teams tapping into students’ special talents and affinities for science, history, art, and language. Use emerging skills in reading comprehension, writing and math to hone life skills in critical thinking, problem solving, teamwork and accountability. My student teams produced models, posters, timelines, science experiment results, reports, recordings, interview transcripts and skits, all contributing to an explanation of the potato’s history and importance. These findings were put on display. As teams completed their assignments they made presentations to the rest of us, complete with visual aids, practicing a skill essential to success in real work environments. The subjects ranged from the origins of the potato in western South America to the impact on the contem- porary Belgian economy. By coincidence, but not lost on any of us, potatoes were making headlines every day in the mid-70s. A European shortage of potatoes due to tainted imports from the Americas led to higher prices for everything, including those fried potatoes. We learned that Belgium’s cost of living index was linked to the price fluctuations of potatoes, among other commodities. So in addition to my students’ abilities to analyze the tuber’s chemical composition, how it grows, is marketed and processed, they were conversational about the ups and downs of Benelux market forces. The final aspect of this project was to present student work, normally seen and evaluated only by teachers, to wider audiences. A part of my classroom was turned into a display area featuring a giant papier-mâché potato. Potatoes at different stages of growing were in containers. We also showed models of potato farms and a chip factory. We held a reception for families and friends for what quickly was dubbed a Potato Museum. News articles appeared and donations of potato related artifacts added to the exhibit. At the start of the new school year, I got permission to continue the project with my next class. Eventually, student-created exhibits filled two previously unused rooms in an adjoining building at the school. We held special events, in- cluding the Potato Olympics, with neighboring Belgian schools participating. Our potato project was a feature of the school’s first International Festival. We organized anti-litter potato chip bag recycling campaigns, the results strung on wires that ran above and along the school’s playground, decorations for our special events. Students cleaned out an old poultry enclosure adjoining the exhibit area and raised chickens in order to sell eggs to raise funds for the project. We started a monthly newsletter “Spud Speaks,” and ran an after school club to oversee the project. Students honed their language skills giving tours in French and other languages. This all took place over several years. I became so absorbed in the project that I took a year’s leave of absence to travel, collect and research the potato across Europe. At the end of the year, as the school needed the space, I packed everything up and left that teaching job to pursue the potato. All that my students and I had uncovered, as well as a fascination with Redcliffe Salaman’s book The History and Social Influence of the Potato convinced me to pursue this quest. The food plant I’d eaten all my life truly had historical clout. Much later, I realized it wasn’t just the potato that deserved to be recognized in a museum setting, but all foods. At the core of what museums do is research, collect, preserve, exhibit and educate the public about their subject. That’s what I did for my first food subject, the potato. My travels took me across Europe, the USA, Peru and China in pursuit of the potato’s story. I met farmers, scientists, chefs, historians, processors, artists, and many others passionate about the potato. My research led me into research labs, potato storage facilities, chip factories, kitchen restaurants and scientific conferences. I’ve walked in potato fields in all the inhabitable continents, driven a huge potato combine harvester, and used a traditional digging tool alongside a farm family in Peru and then shared their meager lunch of field-roasted freshly dug potatoes, eggs and chiles. I’ve sat with a 90 year old East German woman as she served me a piece of her prize potato cake. I’ve eaten potato tortillas in Madrid bars and tasted and talked potatoes in Buenos Aires, Capetown, Kuala Lumpur and Taipei. I’ve listened to potato farmers on the Tibetan plateau of China tell me about their unusual experience of growing potatoes from true seed. I’ve acquired exceptional examples of autochromes, the world’s first color photography made possible by potato starch. I’ve hunted down a rare copy of an epic poem about potato history and witnessed how Incan potato-themed artifacts were, at that time, haphazardly cared for in a Peruvian museum. In the pre-eBay era I frequented auctions, antique shops and corresponded with dealers and collectors. 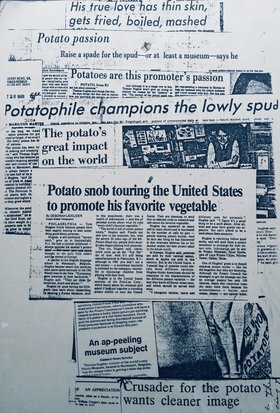 I’ve gone through the files and offices of potato scientists retired or deceased, and for 40 or more years catalogued, photographed, preserved, packed, hauled and found storage space for what is said to be the world’s largest collection of potato memorabilia, archival material and books. At potato conferences in China, Canada, Belgium and the US, I’ve lectured on my experiences and efforts to develop the world’s first museum honoring the potato. Our charming, but decidedly unprofessional classroom exhibit dubbed “the potato museum” at The International School of Brussels was listed in the city’s tourist office weekly handout magazine What’s On. In 1979 Brussels was celebrating its 1000th birthday that year and invited journalists to visit. A New York Times reporter passed on many of the glories of Brussels touted by the millennial committee and insisted on touring The Potato Museum. 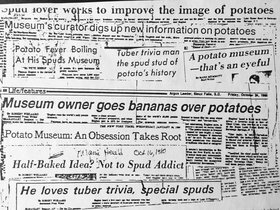 His subsequent article proclaimed: "The Potato Museum...that idiosyncratic and deadly serious institution." The folks at Frito-Lay Corporation in Dallas reacted to the Times report by inviting me to fly first class to Texas to explore their idea of sending me on a series of nationwide tours, visiting dozens of cities to show off items from the collection and spread the word about the “goodness of the potato.” Pringles, made from re-constituted potatoes, were all the rage, and the Frito-Lay folks figured The Potato Museum man was an effective way to get the message across that Lays and Ruffles chip brands were made from freshly cut and cooked potatoes. Thanks to that opportunity, I was able to add to my collection and knowledge about potatoes while garnering positive media attention. I’ve certainly had more than 15 minutes of fame, appearing on local and national tv and radio broadcasts, at libraries, science museums, Boys and Girls Club’s and other venues, always accompanied by my vintage Maine potato basket. It was full of small artifacts from the collection including a small potato-shaped Chinese horse bell called “malingshu,”a Mandarin name for the tuber. I showed jewelry made from potatoes, everyday objects made from potato peelings, and tiny dehydrated potatoes from the altiplano of Andes known as “chuno,” the world’s first freeze-dried food. My appearance on “Sun-Up San Diego” elicited so much positive viewer response I was invited to return for the next day’s telecast, apparently an unprecedented event. I’ve been a guest on talk shows from Boston to LA, Chicago, Louisville and Philly. David Letterman had me on his third ever show asking why as a Belgian resident I didn’t start a Brussels Sprouts Museum instead. Emerging from so many Green Rooms to be interviewed, I realized that some of the hosts I spoke with had done their homework and a lively conversation followed about potatoes. But to other talk show personalities and local reporters, I was just another pitch man spouting talking points, until I found a way to engage them, which I almost always did. The potato sparks something in most people. Once the hoopla of the media tours ended, my wife and I moved back to the U.S., settling in Washington, DC, where I found a job teaching fifth grade again at an independent school. Everyone kept asking to see the potato collection, so we established an exhibit on the ground floor of our rented Capitol Hill townhouse. Open by appointment only, the exhibit’s existence spread by word-of-mouth and that unleashed another round of publicity. Any media outlet facing a slow news day sent reporters over to interview that eccentric potato couple. 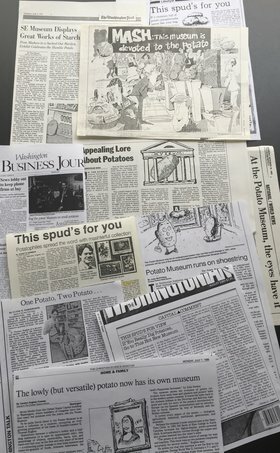 The Potato Museum was covered by multiple media outlets, from NBC Nightly News, the Wall Street Journal, New York Times, Washington Post, to Charlie Rose, then based in Washington, DC, and The New Yorker. It attracted coverage in the foreign press, too. We got fan mail from abroad and visitors, too. A full binder of press clippings and a box of old video tapes from the 80s is a reminder of all that. Every time a reporter found it strange and amusing to be exhibiting potatoes, we would ask “Did you eat breakfast, or lunch today? Are you planning to have dinner?” They started to get it. We also reassured them we were “serious but not solemn,” about the terrific tuber. In hindsight, we realized we were advocating for the merits of food and food-themed museums as serious pursuits, as much as we were praising the potato. The potato matters, and food matters. Food fuels all human and animal endeavor, is part of every human celebration, and connects families and community. In contrast to the life-depleting subject of war, the food that sustains us is a vital world topic, and it largely has been overlooked by museums for decades. Besides journalists, other visitors included local school groups, couples on first dates, neighbors, including members of Congress and staffers, a few tourists, and a few museum professionals. Several of them claimed to be disillusioned by their jobs saying that what we were doing with the museum was inspiring. One time, a museum professional brought a group of docents to Washington to experience how diverse subjects could be interpreted. The group visited a historic tavern in Alexandria, the U.S. State Department Reception Rooms and The Potato Museum. 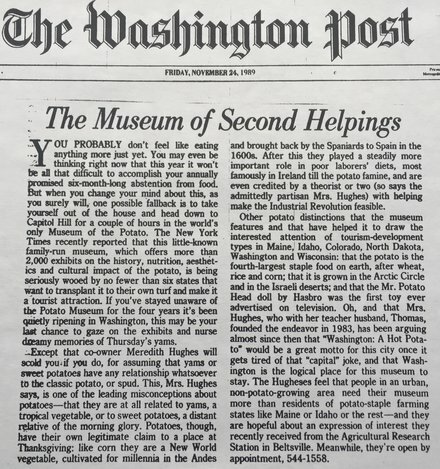 With the help of friends, The Potato Museum achieved non-profit status, held a series of monthly all-potato meals attended by invited guests including the Washington Post’s food critic, at the time, Phyllis Richman. The Potato Museum’s monthly “Peelings” was mailed out to a growing group of subscribers. A Japanese TV production crew visited the museum to film a segment for a documentary about potatoes. After which, the filming continued at an all-potato feast we arranged at the Watergate Restaurant prepared by its celebrity chef, Jean Louis Palladin. Then I was invited to return to Belgium, where it all began, to mount a temporary exhibit at a European potato growers’ convention. In the late 1980s the Smithsonian Institution hired us to loan parts of our collection and help curate the Seeds of Change exhibition at the National Museum of Natural History celebrating the Quincentenary of the Columbian Exchange. It was the largest project the museum had ever mounted. The “seeds” included horses, slavery, sugar, disease, potatoes and corn. Originally we were contracted only for the potato portion of the exhibit, but in the final months before the opening, the museum asked us to organize the corn section as well! That’s how we began to make the transition from exclusively focusing on the potato to exploring the other foods originating in the Americas such as corn, chocolate, chile peppers, tomatoes, beans, squashes, sweet potatoes and many tropical fruits. It was a busy period, because I was still teaching full time. Recognized as one of a handful of Klingenstein Foundation Independent School Teachers of the Year, I earned a spot on an Earthwatch research expedition to Peru. 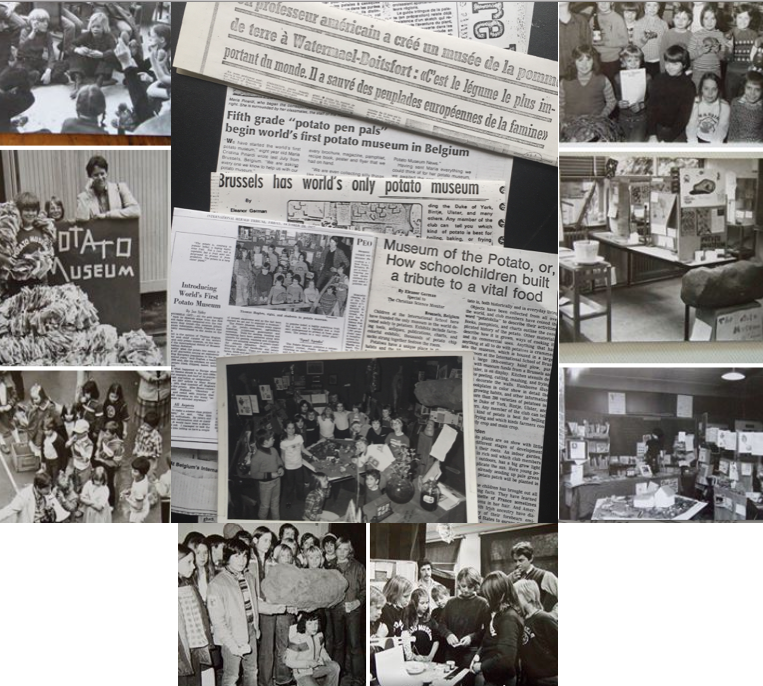 At about the same time we were hired by Canada’s National Museum of Science and Technology to loan much of our potato collection and develop scripts for a major 6,000 square foot exhi- bition, "The Amazing Potato." This was to be the first show celebrating the museum’s grand reopening after being closed for renovations. The directors had conducted a national survey to discover what Canadians wanted to see exhibited and the potato topped the list. Prior to all that I had been interviewed on the popular cross-Canada radio program, As It Happens, which may have influenced the sur- vey. A team of Canadian conservators spent several days with us selecting artifacts and packing them up. As with the Seeds of Change project, Meredith prepared background and script narratives for the exhibition. Many months later, we were in Ottawa for the grand opening and participated in the ceremonies. The exhibition proved so popular it was extended for a second year. It remains in my mind the standard for how the potato’s story should be told. About that same time the Smithsonian Folklife Festival, an annual event staged on the national mall around the Fourth of July, focused on Peru. At the close, the entire contents of a typical Peruvian potato farmer family’s household, which had been shipped in and displayed at the festival, were donated to us for use in our educational programs. The objects featured several versions of the Peruvian food plough that is still in use on the steepest slopes for harvesting the crop. We have put these in the hands of count- less young people participating in our programs. Over the past 30 years The Potato Museum has closely monitored the potato's many ups and downs while fulfilling our primary mission to preserve the plant's fascinating history and share its story both locally and globally. Specifically we’ve: been the voice of the potato giving hundreds of media interviews including for talk shows as far away as Australia, written books and published articles, including a major his- torical overview for Smithsonian Magazine, given conference keynote speeches, lectures and participated in panel discussions in Belgium, Peru, China and all over the USA, consulted on documentary films, provided research and editorial assistance for major articles about the potato in The New Yorker and The National Geographic Magazine and presented interactive programs about the potato in hundreds of schools, libraries, museums, senior centers and state fairs in Missouri and California. In the early 2000s there was a renewed interest in our work on behalf of the potato. We were involved in two initiatives to establish the potato museum collection and programs in Peru and or Ireland. Both projects fell victim to the world-wide economic collapse of 2008. While those doors closed, another opened when the United States Botanic Garden, in Washington, DC, invited us to stage their most ambitious temporary exhibit to date. A comprehensive exhibition on the history, social influence and science of the potato, created from the Potato Museum collection filled the entire east wing of the Botanic Garden’s Conservancy. In addition, scientists at Michigan State created an indoor growing chamber in which visitors could see the above ground leafy green potato plant and then, by lifting a flexible panel, observe the below ground scene of root networks and swelling tubers. Besides curating the exhibit, we developed hands-on activity carts and scripts for the docents we trained to use with visitors. We also gave gallery talks and workshops for educators. We organized an entire weekend public workshop on the “science of the potato” with hands-on activities at ten different stations. With the help of dozens of volunteers, who we trained, visitors produced an electric current from potatoes, explored the concept of Fibonacci numbers, tested for the presence of starch, conducted a series of math-related and food chemistry activities and used a food processor to separate the parts of the potato into liquid, fiber and starch.